I need your help pretty quickly! I’m processing my way through this book and realizing just how ingrained in me being insecure is and just how much I don’t know what I’ll look like on the other side of this process. The fact that my Heavenly Father who knows me down to my laminin is the author of this renewal and transformation only makes me more hopeful and excited to see the other side, to experience the true freedom and courage that comes with taking back what these years of pride and fear and insecurity have stolen from me. I read this the other night and I am still chewing on it, ” Neither God nor you have anything to gain from your persistent insecurity.” Wow, I have nothing to gain from continuing this way? Not attention, not affection, not friendships, not love, not admiration, not respect, not influence, not power, not affirmation, not time, not freedom, not grace-NOTHING. Well, if that’s the case-break me, wrench this out of my soul until there is nothing but the gaping holes of its’ torn up root system. The holes that only Jesus can fill, the holes that once filled will be more than enough to satisfy me. That I can walk boldly and courageously in who God made me to be, not wasting my time here on this side of eternity floundering in my insecure, ineffective, non God glorifying comfort zone. I am in a really good spot in life. I kind of have my bearings being a working mom of 2 boys. I kind of have my bearings with being a wife to an amazing man and working towards the goals and visions we have for our family. I’m definitely in a sweet spot with my relationship with Christ. Nothing earth shattering or huge, just a consistent relationship with my heavenly Father that reminds me that I am his and he is in control. So all that to say, I am in a spot that as I look at my boys, I am just overwhelmed with the passage of time that I can’t stop and I don’t want to stop. I liken it to trying to hold on to sand. I mean last week Luke pronounced “cauliflower” like “cacalower” and this week, he can say cauliflower. Jake was stumbling with his steps, now he is zooming everywhere in the house. Michael and I did a REALLY cool thing a few weeks ago and created jars of marbles that were filled with the number of marbles that were the number of weeks left until Jake and Luke turned 18. Yes, they will still be in our world and home, but our true time of influence is minimal. At the end of each week, we throw away a marble because that time to have influence in their lives is gone. 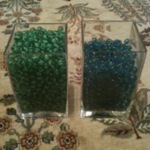 It is INCREDIBLE to look at the difference in the number of marbles between their 2 jars. I have a friend with an 8 year old and 2 year old and the difference is STAGGERING. The 8 year old’s jar is half full!! It has really made Michael and I think and pay attention to how intentional we are being as we spend time with our boys. I find that I am trying to be more patient, kinder, and more attentive to the little sweet things of their lives. I’ll read Luke 3 stories instead of 3, I’ll hold Jake a wee bit longer before I put him down. These days are fleeting and I pray daily that God would continue to help me realize the value of this precious, precious time. It also is making me think about making sure I am valuing my time with Michael. He is truly amazing and I want the way I treat him to TRULY reflect what I think about him. I am absolutely loving the new series at Buckhead Church. Andy is really challenging us to set guardrails in different arenas in our life to prevent us from going off the cliffs of life. The last two weeks have been INCREDIBLE and I am so looking forward to the next four weeks. It basically is talking about us setting a personal standard of behavior that becomes a matter of conscience. This is not a standard for you and everyone around you, it is a standard for yourself based on where you want to go towards living the life God has for you. I want to make the most of the time I have here on earth, not wasting it flirting with disaster and pushing my limits. Andy has made so many great points, but a couple have really stood out. In a year, what habit or habits will I wish I could go back to right now and change? I’m sure I will come up with some more, but for now, that’s good. Well, we are in the middle of a great series at church called, “White Flag.” It is a great series about surrendering and running from God. I really thought I was in the clear with this one because to be honest, I didn’t really think I had a GLARING place that I was running from God. Sure, I sleep a little longer in the morning instead of having the discipline to get up at 6 EVERY morning to read my Bible. Yes, I may eat more than 12 tortilla chips at the Mexican restaurant. Shoot, I even drink a bit of wine & beer, but none of my stuff seemed on par with some of the examples Andy was using of cheating, lying, etc. God apparently thought differently. Let me rewind a few years. Nine years ago this September my dad killed himself. God had prepared me as only a loving God could and while it was awful, I always have had a peace that God would use my dad’s action for good to accomplish His purposes. The night I got the call from my mom I started clinging and praying that God would protect my heart and mind in Christ Jesus just like He promises. I also prayed that I would grieve well no matter how far down the road time had taken me. I prayed that whatever part I could play in breaking the molds that had led my dad to that decision, I would do them. Now any good thing taken out of balance becomes a problem. That brings me to where I was sitting today. I’ve ALWAYS been a worrier and a fearful person so I’ve never really thought much of it until recently when I just have gotten sick of it. Yeah, everyone gets a little worried and scared, but I am ridiculous. Frankly, I am tired of it. I’m tired of not trusting that God has it all. I’m tired of my fears being disregarded because “it’s just Kristen.” I’m tired of coming up with disorders that modern medicine hasn’t even thought up. Above all, I’m tired of connecting dots in my world as signs that God’s proverbial other foot is going to drop at any moment. That’s just not how God works. I noticed that my worrying got worse once I got married and escalated even higher once I procreated. Being in my head can be torture sometimes. I know that I have an inflated sense of control and feeling responsible for things that aren’t mine to worry about. If Michael is crabby, I have somehow caused it and need to make him happy again. My day is made or destroyed based on how Michael responds to something I did or didn’t do for him. I say or don’t say things to him to somehow prevent him 30 years from now hooking a hose up to his car. If I can find Luke or Jake’s disorder on the internet before the doctor does, I can somehow save their lives or make them better. I seem to think that if I act a certain way or say a certain thing, I will be able to determine the outcomes for my family and me. Therein lies the problem. So back to this morning. I am sitting there as Andy is talking about people who cling to worthless idols forfeit God’s love for them, they don’t experience God as they could in their lives. My heart started stirring. You see, I have been praying that God would reveal things that are in the way of Him melting further into my heart, that He would reveal the idols that are in my life. Well, he delivered this morning. As the closer started at the end of the service, the tears also started. I thought to myself, “What in the world, I was fine five minutes ago! ?” As I felt myself get up and walk to the front, I was confused as to what could be causing these tears. So I listened and realized I was at a new stage of grieving. Yes, eight and a half years later, I was going to hear that I have so been protecting my heart to not feel what I felt that night in September, that I have been doing anything I could to avoid it. I have been playing god. In my effort to allow my dad’s death to be used for good, I had gone too far and was trying too hard. Thus the desperate attempts to please Michael and the depth of the hurt when I felt my efforts had been rejected and so I would retreat into my abilities and myself a little more. So goes the cycle of me with Michael and he has NO idea. How could he, I just realized the depths of it all this morning. No wonder we’ve had the problems we have the last few years. I’m doing the exact thing I was most afraid of. The attempts to find the missing internet article that could explain Jake’s gassiness or Luke’s crazy knee pain to make sure we don’t miss anything that we could treat if caught in time. I mean if I spend all my efforts worrying and going down What If Blvd., I don’t ever really have to trust and let God be God. My idols of control, fear, worry, and responsibility have all been driving me to trust in them and I am not getting to experience the fullness of God in my life. Because I’ve been scared that if I let go of any of those, I’ll miss something and something will happen. A thing that will make me feel like I did that night in September. So that is where I am. I’m grieving all over again missing my dad, missing who he was in my life, missing who he could have been in Luke and Jake and Michael’s world. Earlier today by surrendering, I’m reentering that world of feeling helpless that I experienced that night in September when the biggest thing to ever really hit my world hit. However, as hard as it is for a closet control freak to feel helpless, I’m not hopeless. I cling to a God who loves me, who holds me, and in whom my hope lies and I will not be disappointed. These 2 videos highlight things that Luke has been learning in his preschool at work. Sweet sweet boy. Thank you Enzee and Tay Tay and Anna and Katie and Leah (& Mandi & Jenn) You are doing a great work. “God opposes the proud but gives grace to the humble.”[a] 6Humble yourselves, therefore, under God’s mighty hand, that he may lift you up in due time. 7Cast all your anxiety on him because he cares for you. Yes, that is what I am praying for the students and volunteers, but I have also been praying that for myself. Well, in God’s perfect way, He’s been answering that. Really hard to be humbled, but grateful He deems me worthy to draw me closer to Himself. I know that I am in the process of unpacking all that is in this verse for me, but for now I’m resting against the chest of my Heavenly Father knowing that His grace is enough.